[dropcap color=”#008040″ boxed=”yes” boxed_radius=”8px” class=”” id=””]W[/dropcap]est Bengal Chief Minister Mamata Banerjee has triggered deep unrest in large sections of the State with her decision to appoint Siddiqullah Chowdhury as Minister of State with Independent Charge of Education, Library and Parliamentary Affairs. Banerjee had already startled the nation with her decision to take oath of office in the name of “Ishwar and Allah.” Hitherto, it has been the norm, nationwide, to take oath in the name of one’s respective religious affiliation. Some ministers, notably Arif Mohammad Khan, have taken oath in the name of “Ishwar”, in deference to a larger civilisational ethos. But the West Bengal Chief Minister’s oath has been unprecedented in independent India and has troubled many. Siddiqullah Chowdhury is the sole Minister of State with Independent Charge, and the move has created deep rumblings inside the State. The decision to put a sensitive subject like Education in the charge of a person who is also the State general secretary of the Jamiat Ulema-e-Hind that runs thousands of madrassas (Islamic seminaries) instead of formal schools where children can be educated in the modern arts and sciences is questionable. Chowdhury is also a lieutenant of All India United Democratic Front (AIDUF) leader Badruddin Ajmal, who was routed in the recent Assam elections due to his inflammatory speeches against Hindus. Mamata Banerjee gave him a Trinamool Congress ticket (from Mangalkote constituency) to woo Muslim voters who comprise about 28 per cent of voters and are her strongest support base. [dropcap color=”#008040″ boxed=”yes” boxed_radius=”8px” class=”” id=””]S[/dropcap]oon after the election, Siddiqullah Chowdhury publicly expressed support for the Jamaat-e-Islami of Bangladesh and urged all political parties in West Bengal to support those facing problems from the Sheikh Hasina government – that is, Islamic fundamentalists. He asked the Chief Minister to put pressure on the Sheikh Hasina regime to stop “atrocities” against “religious leaders” in Bangladesh as a return for taking Muslim votes during the elections. Given the gruesome murders of bloggers fighting Islamic fundamentalism in that country, it is easy to predict a tumultuous time ahead for the people of West Bengal with Jamiat personnel in government. The Communist era circular, “shuddo-ashuddo” (pure-impure) to indicate politically correct material to be taught to students, or de facto excised from the curriculum, could be a small indicator of what lies ahead for Bengal students. 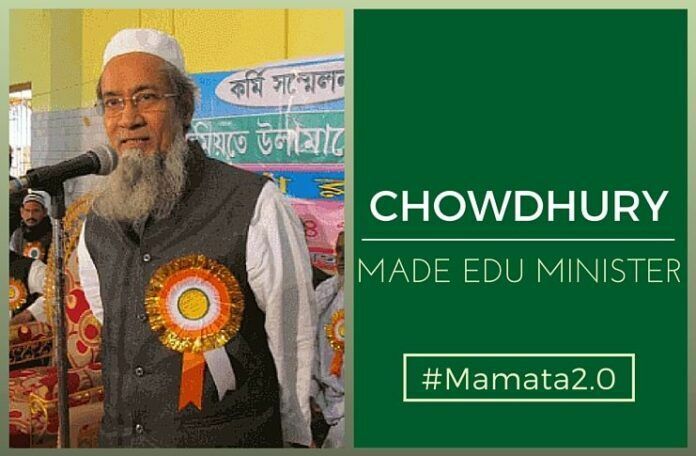 Chowdhury gained notoriety after the Burdwan blast of 2 October 2014, which unearthed a dangerous plot to topple the Bangladesh government from West Bengal, when he demanded that investigating agencies should not target madrasas every time a subversive activity took place. The blast, in a house in Khagragarh locality, killed two suspected Indian Mujahideen terrorists and injured another. Later, the police seized several dozen improvised explosive devices, RDX, wrist watch dials, SIM cards, Election ID cards, passports, among other materials. The building was owned by Trinamool Congress leader, Nurul Hasan Chowdhury, and its ground floor was used as a party office. The first floor was rented to one Shakil Ahmed who died during the explosion. When the National Investigation Agency took over the case, Chowdhury organised a huge rally against the NIA and other agencies under the banner of the state unit of Jamiat Ulema-e-Hind and decried attempts to portray madrasas as breeding grounds for terror activities. [dropcap color=”#008040″ boxed=”yes” boxed_radius=”8px” class=”” id=””]S[/dropcap]iddiqullah Chowdhury is among seven Muslims in the West Bengal ministry. Three were given Cabinet rank, viz., Firhad Hakim (Urban Development and Municipal Affairs); Javed Khan (Disaster Management and Civil Defence); and Abdur Razzak Mollah (Food Procurement and Horticulture). The remaining three Ministers of State include Giasuddin Mollah (Minority Affairs and Madrasah Education); Gholam Rabbani (Tourism), and Zakir Hossain (Labour). The State unit of the Bharatiya Janata Party boycotted the swearing-in ceremony on May 27 to protest against the attack on party leader Roopa Ganguly in Kakdwip the previous week, allegedly by a group of TMC workers. However, Union Cabinet Ministers Arun Jaitley and Babul Supriyo, Asansol MP, attended the function. West Bengal, like Kerala, witnessed a plethora of violent incidents against BJP workers in the wake of the election. While events in Kerala received some media attention, the incidents in Bengal were mostly hushed up until the attack on actress and party leader, Roopa Ganguly, proved difficult to suppress. On May 28, a bomb was hurled at a Trinamool victory rally in North 24 Parganas district and nine persons, including six children, injured. Distressing but wholly unsurprising. Mamata’s parivartan is confnied to change of personnel not in policy. She is more left than the Left. Her rule can result only in greater marginalisation of Hindus in the cultural sphere and greater of inroads by poverty in the hapless state. But there is no need to weep for West Bengal. In a democracy, people get the government they deserve. Hindus in Bengal will surely wake up sometime. We can only hope that it will not be too late for them and the country.